Published by Joshua Clare-Flagg on 13 Jun, 2018. 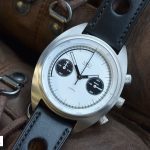 I don’t often review watches over £1000. But when I do, I always make sure they still offer excellent value for money. 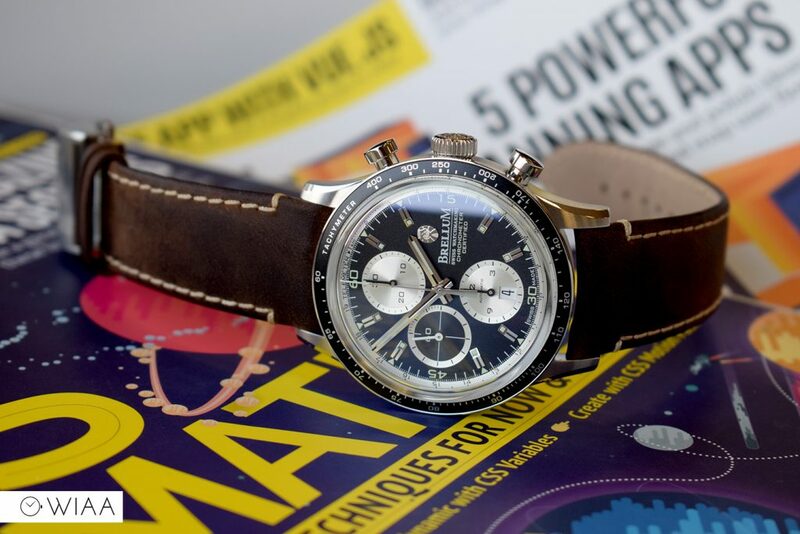 Think the Formex Element and Christopher Ward Trident Chronograph for example. 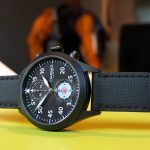 I’ve been keeping my eyes on Brellum ever since they smashed into the scene – offering visually beautiful watches that appear to be the same quality as luxury brands worth double the price. I’m pleased to finally get my hands on one. 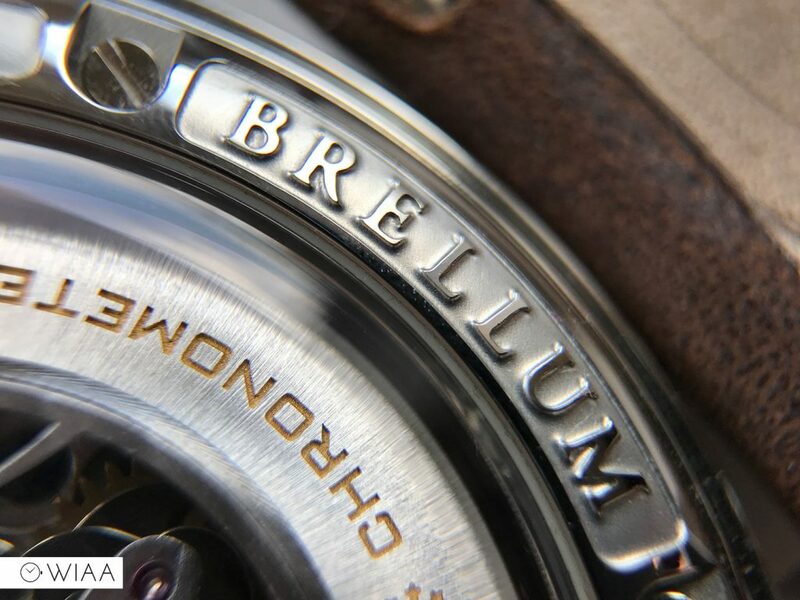 Only 300 Brellum Duobox watches are produced each year, which is indicative of the exclusivity of this watch – however it still remains “affordable” for what it is, despite having a price tag of just shy of £1900. Let’s take a closer look to see if it truly is as good as it seems. 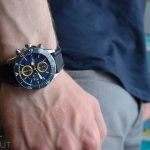 Why is this family of watches named Duobox? 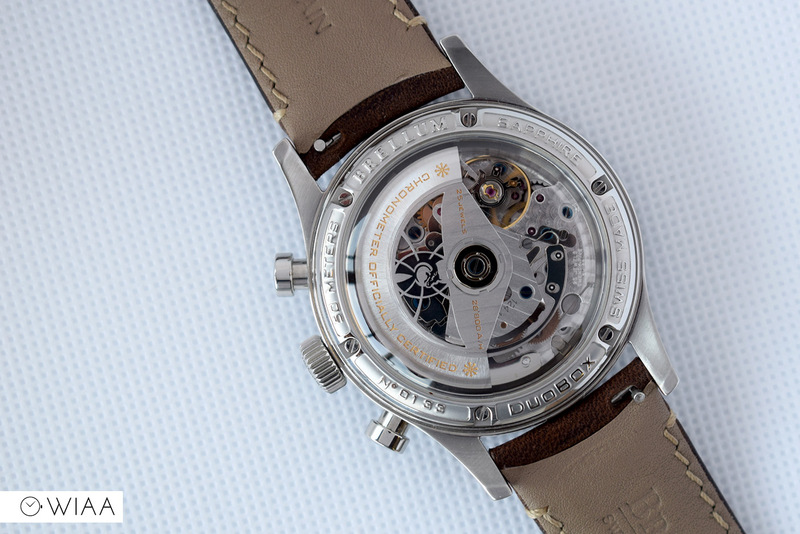 It’s because of the highly boxed sapphire crystals sitting on the top and within the caseback. They’re a sight to behold, supplying a dramatic view at tight angles. The anti-reflective coating is very good indeed, a flash of blue zaps across the crystal when the light catches it right. Perhaps it’s not quite Image level, but it’s still great. 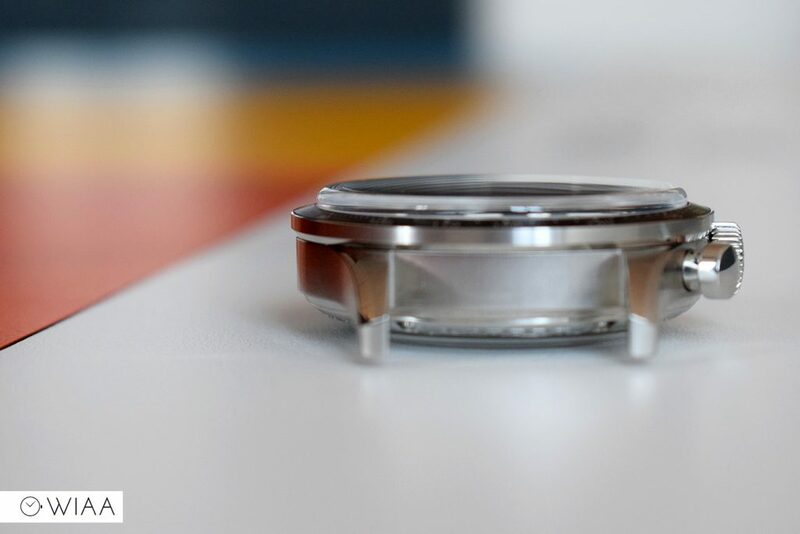 The case measure 43mm in diameter, but it actually wears 42mm as the bezel sits wider than the case. 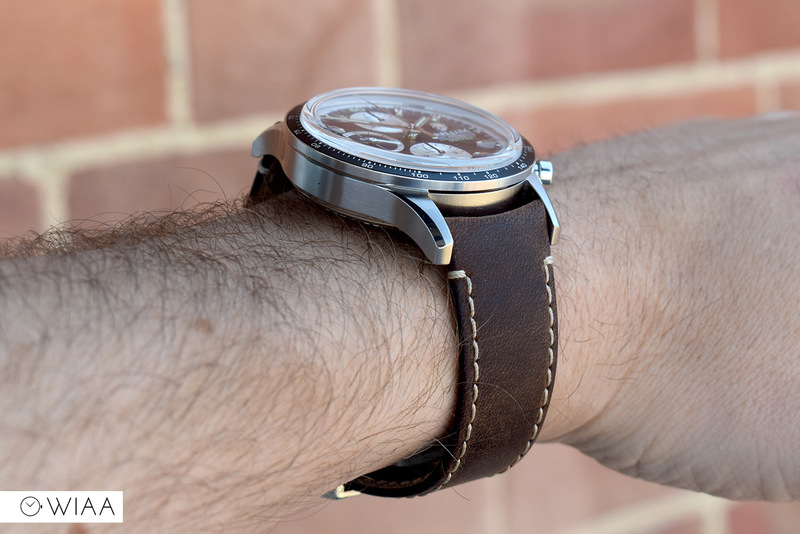 This is a really neat touch, as it also doesn’t look as large as a 43mm usually would – this tucking in of the main case really tightens it all up. 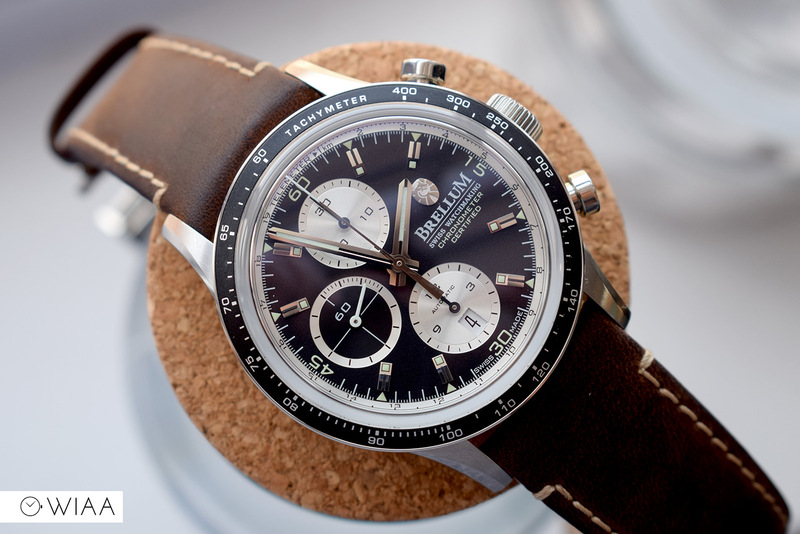 Thee’s a variety of finishes; it is primarily brushed due to the sides of the case and the bezel section. 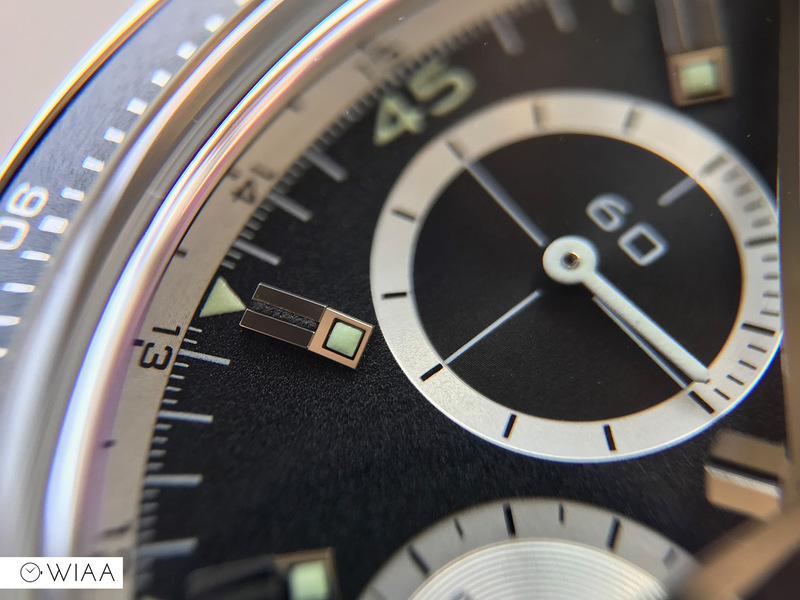 A polished bottom ridge of the bezel is a nice touch, working well alongside the polished shoulders of the lugs. 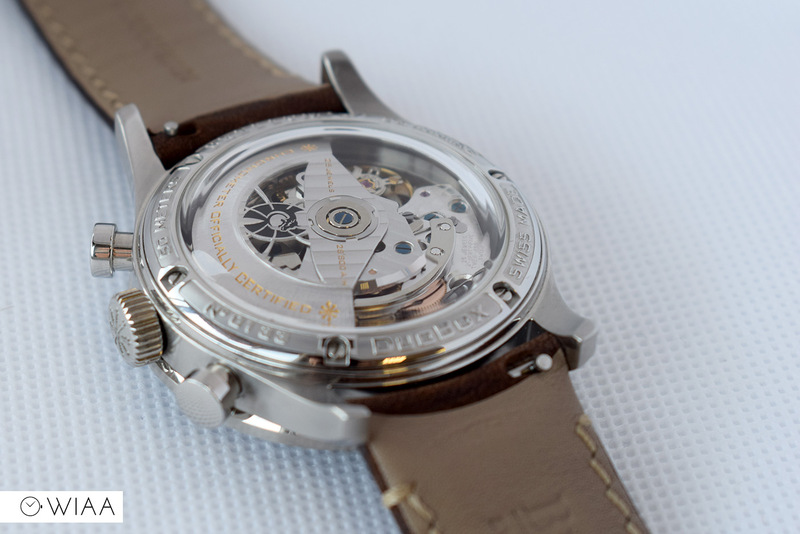 The caseback has a polished ring around the edge and features splendidly deep stamped detailing. 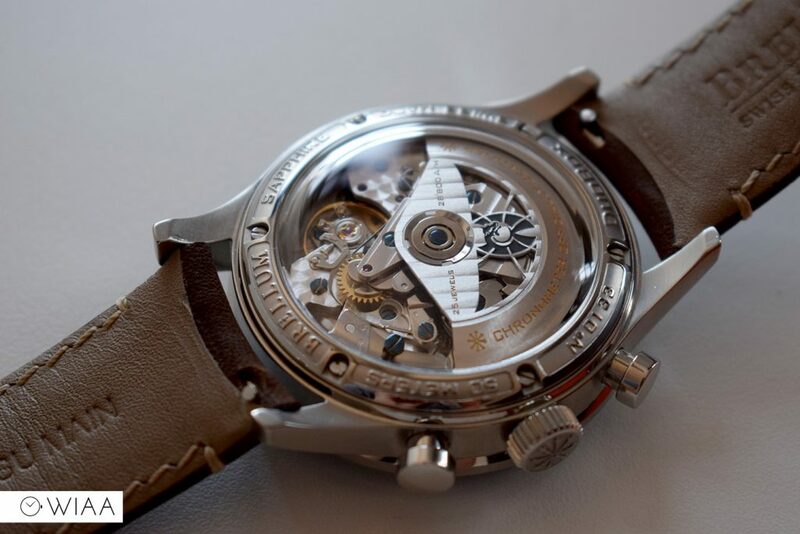 It showcases the movement effectively thanks to the aforementioned boxed crystal. 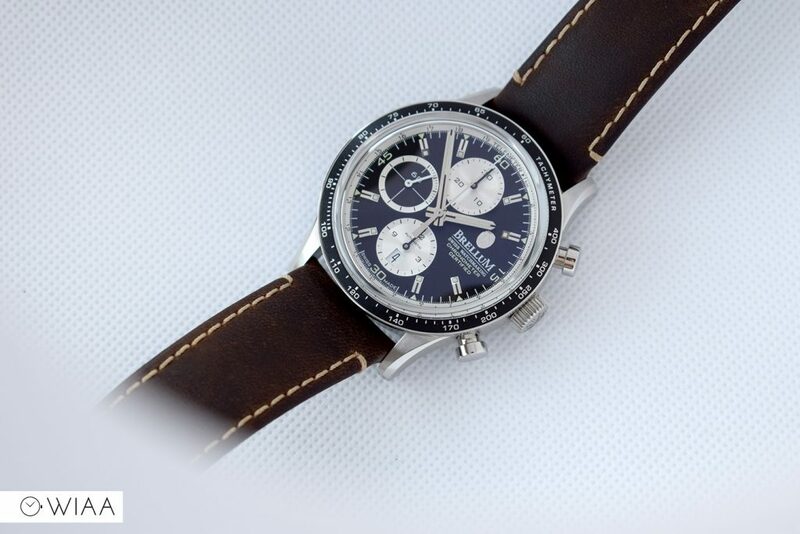 Thin bezel insert is most likely printed aluminium, with a tachymeter. It’s not too overpowering; framing the dial and boxed crystal well. 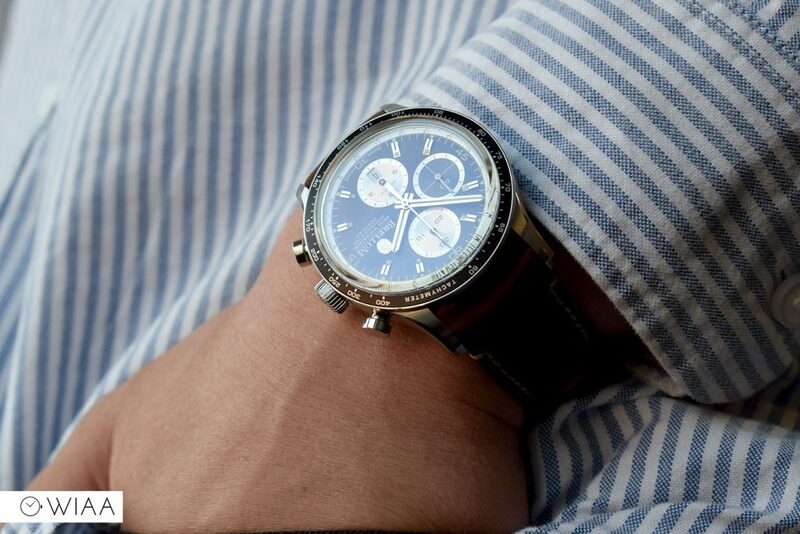 You control the chronograph by the polished pump-grip style pushers. The non screw-in crown has very interesting and delicate detailing engraved on the end, accurately and comprehensively completed. 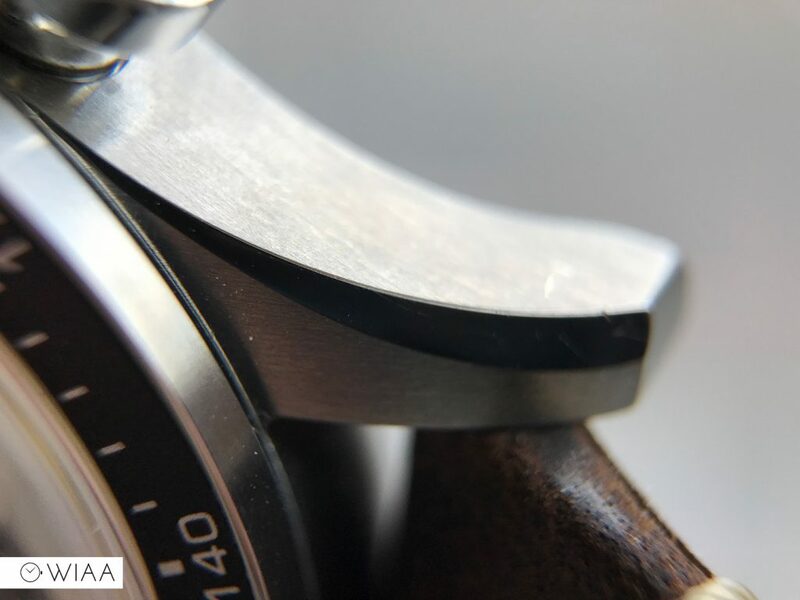 A really great and not often mentioned point is the face that the inner sides of the lugs have two sets of holes – one set is what I assume is for standard straight straps, and one closer to the case for the curved strap provided so it fits snug around the curvature of the case. 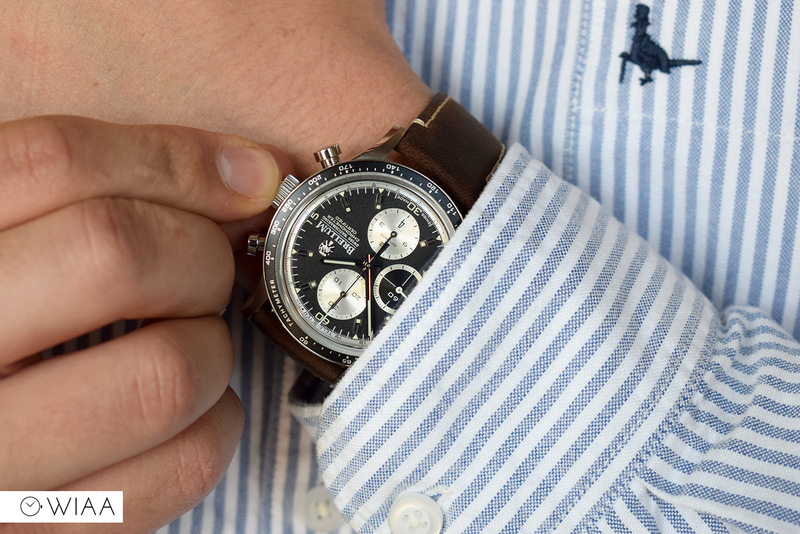 The Pandial boasts a domed dial with plentiful of features and details. 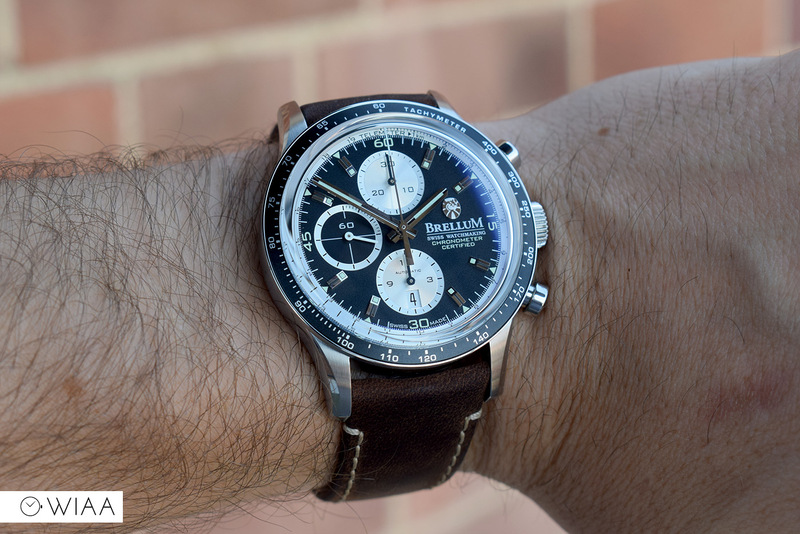 It’s known as a panda style – due to the contrasting subdials and dial base. 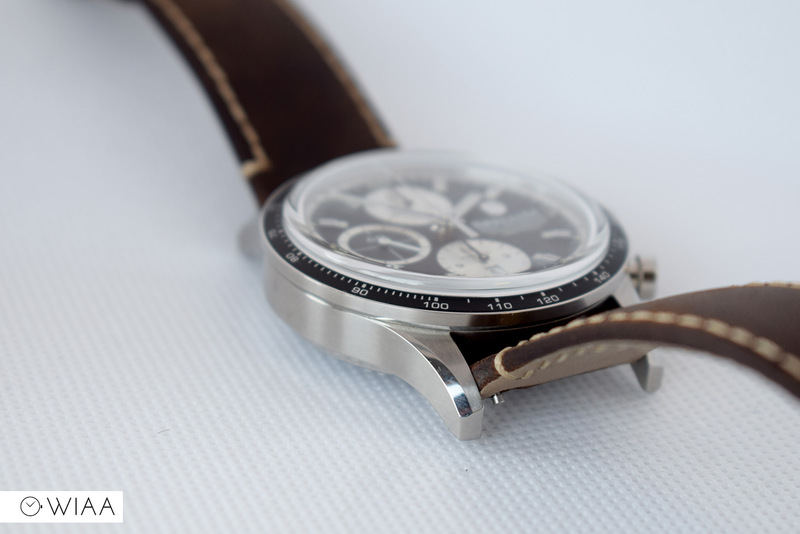 The dial base itself has a gentle and subtle texture to it which is not noticeable until close up. I always love a decent, heavy-duty applied logo, and that’s just what we’ve got with this Brellum. The logo icon is a Wyvern, a dragon like beast with wings, a bird’s body and a snake’s head. 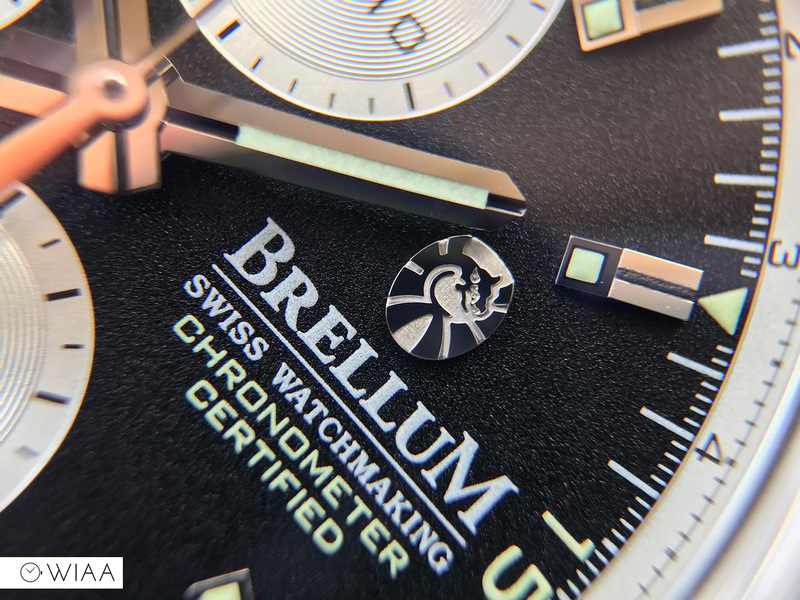 The printwork below the logo might be a bit too large, but I can see that it balances the subdial at 9 at this size. 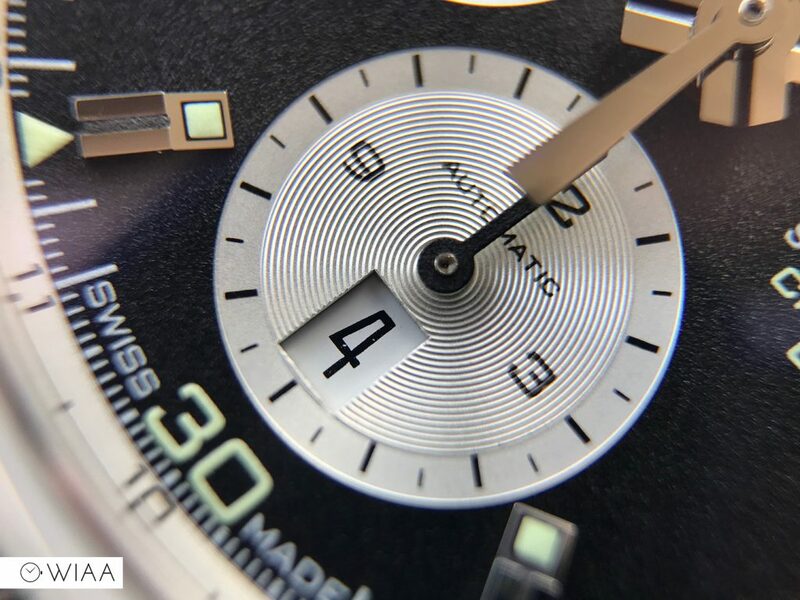 The other applied hour markers are wonderfully detailed: with a lumed block at the angled base, and a slit at the top to mimic the distinctive style of the hands. They also have a lumed triangle stationed at the top. 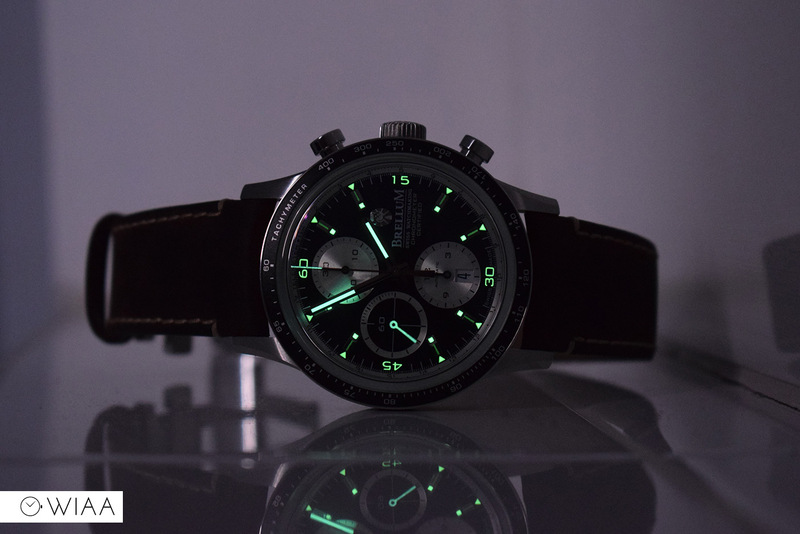 The lume in general isn’t outstanding which is a shame, as there’s plenty of lumed elements; one particularly nice unexpected touch is the numerals within the minute track. 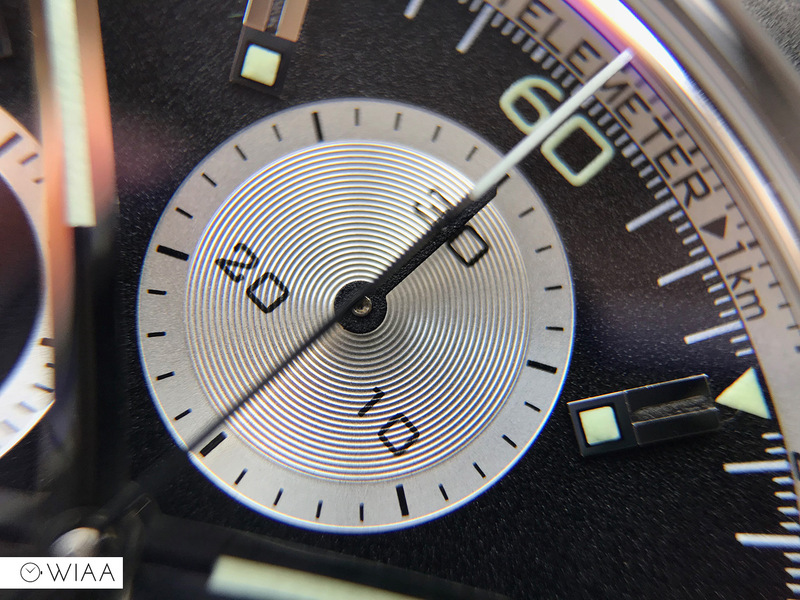 The dial has a telemeter around the outer edge, which can be used to measure distance using the difference between the speed of light and sound (say for instance, how far away a thunderstorm is). This outer scale actually has a very light concentric circular pattern within it, which is an unexpected level of detail. The hands are a very distinctive yet bold and legible shape, almost like two edges of a sword split with a lumed central channel for part of the length. 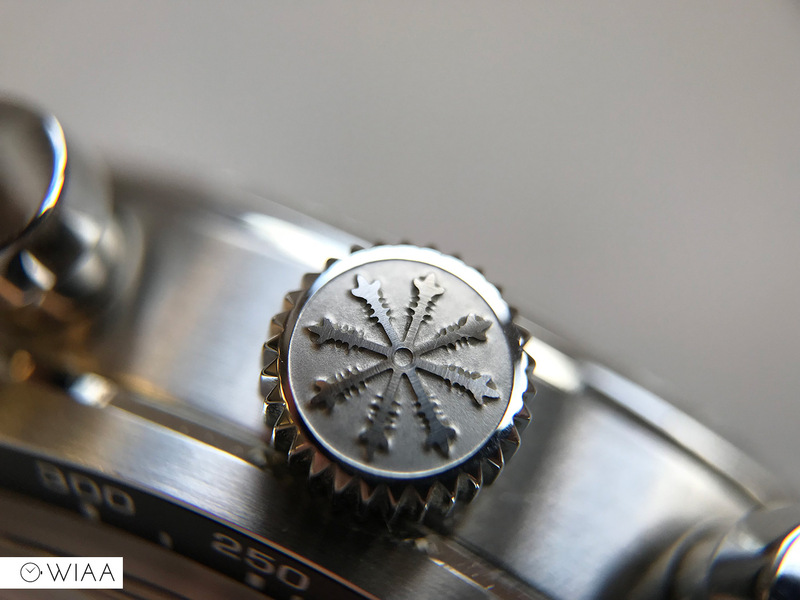 The subdials are pleasantly detailed – with a concentric circular patterned base. 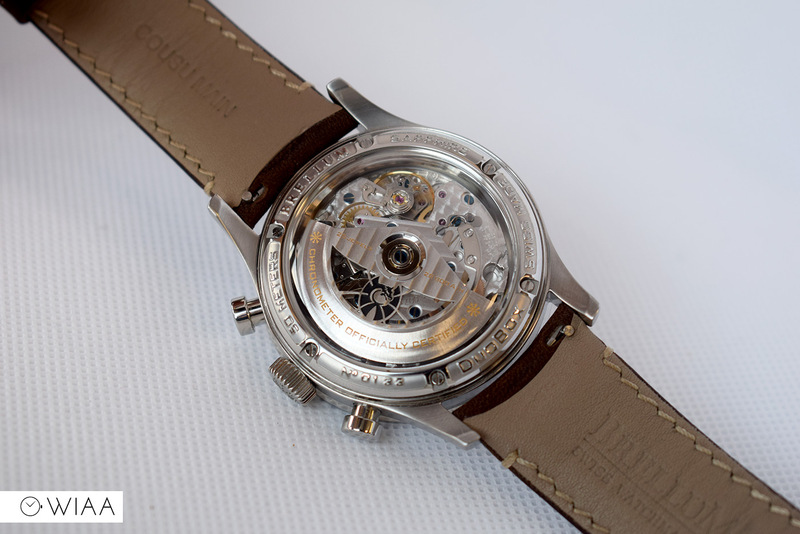 The bottom subdial has the date window concealed within, in a similar colour making ensuring it remains subtle. 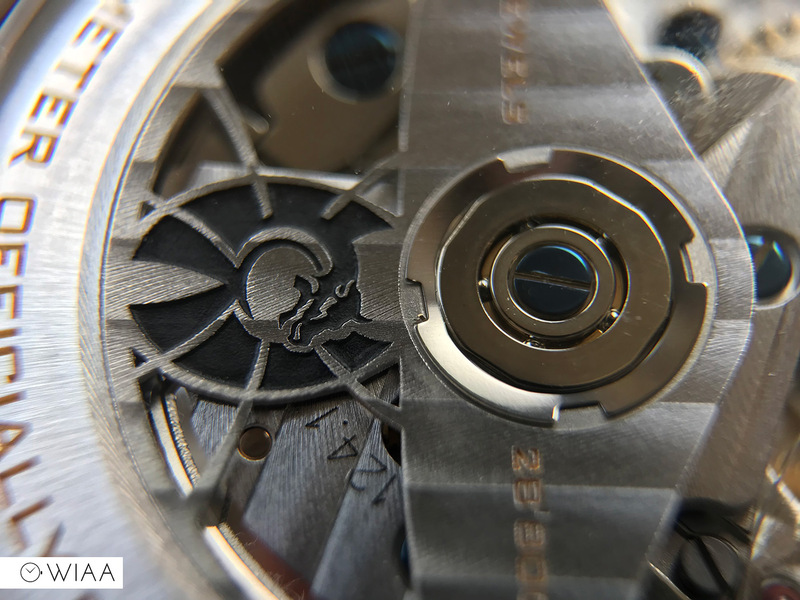 The subdial at 9 for the running seconds is different in design, with a black centre and silver surrounding ring. 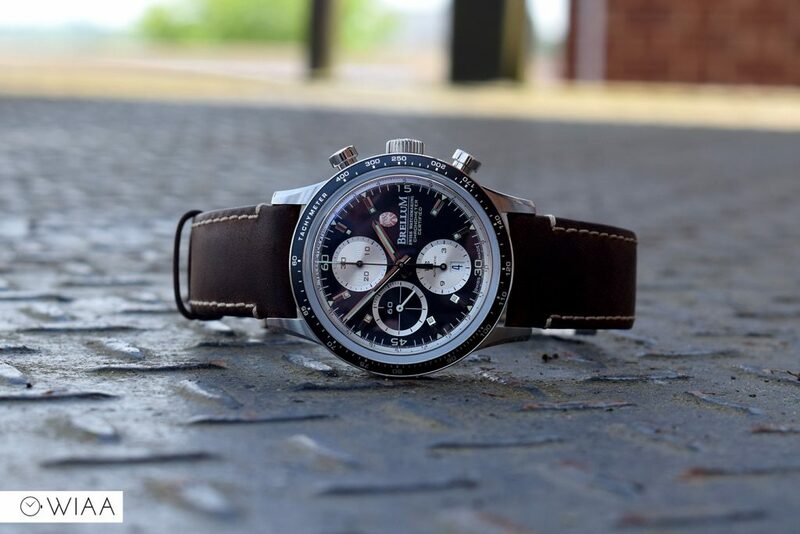 The strap is hand-made of Brown Zora calf leather. 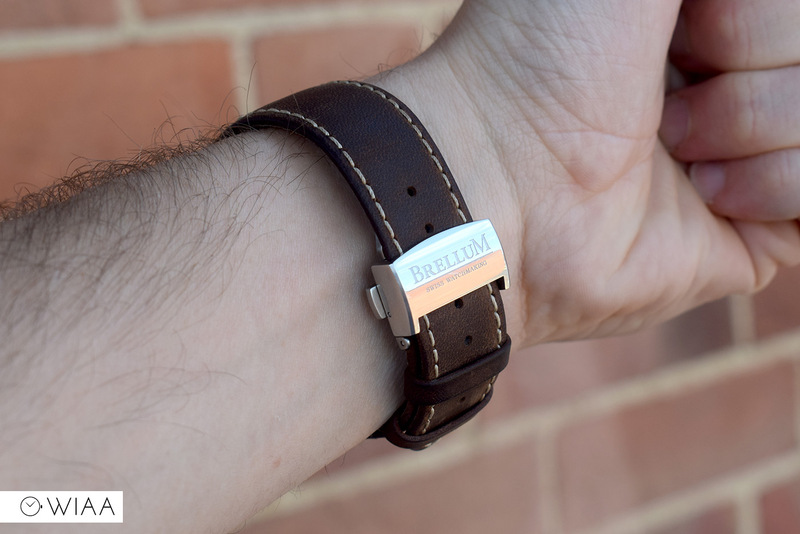 It’s soft and comfortable on the wrist, with a rustic and rugged top grain. 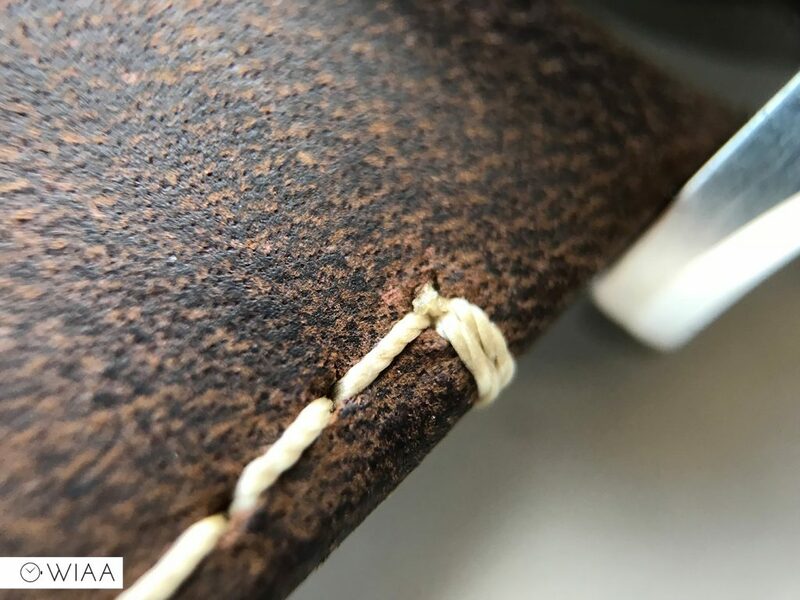 The creamy detailed stitching complements the brown well. 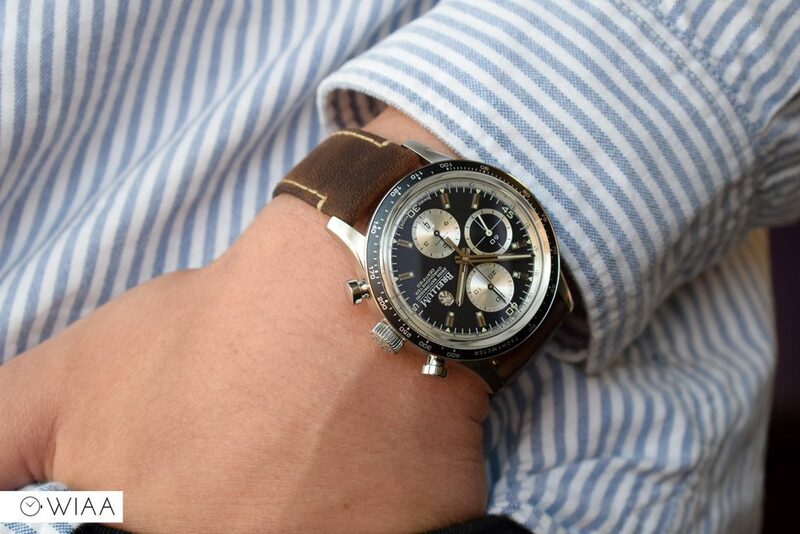 The strap is fitted with quick release pins, meaning they’re super quick and easy to change. It’s curved at the top, meaning it fits around the case, creating a closer profile. I really like it – there’s much less gap than usual, also thanks to the extra set of closer holes in the lugs. 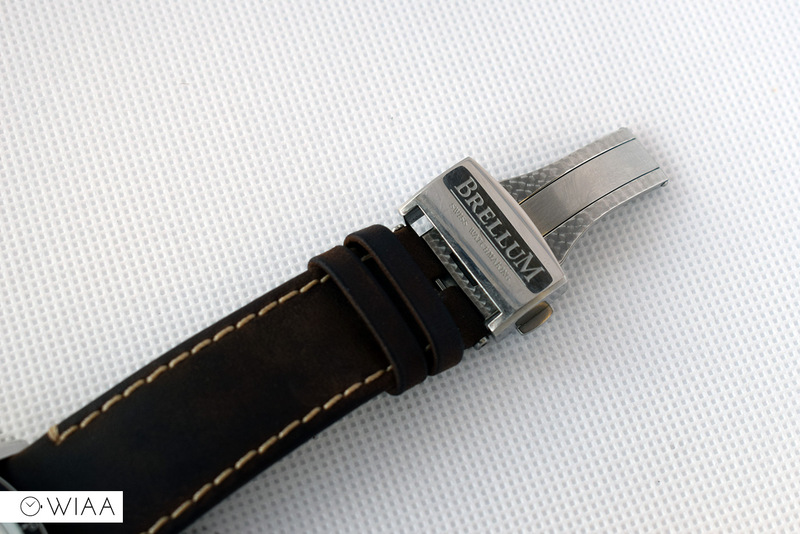 The deployant buckle has a large top bar, with the logo deeply and accurately engraved. It’s polished, and as you can tell it’s not great for scratches. 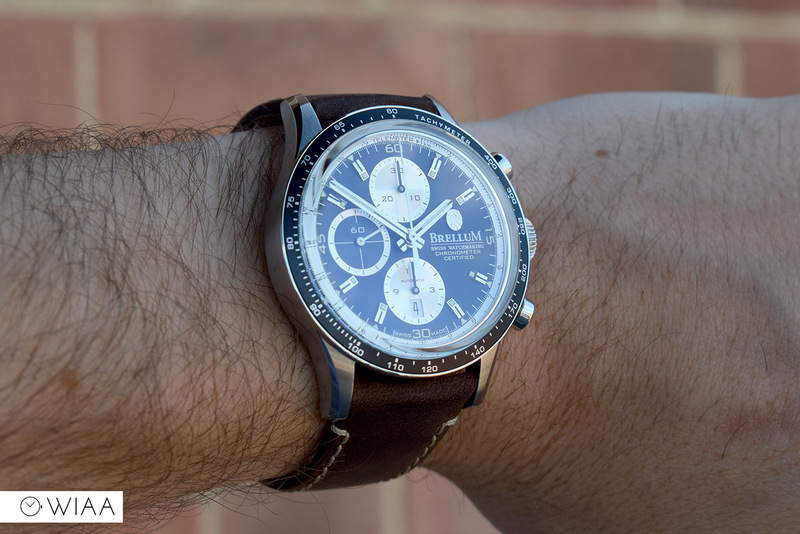 The movement is classed as the Brellum BR-750-1, which is basically an ETA Valjoux 7750 – quite possible the most well-known automatic chronograph available to date. 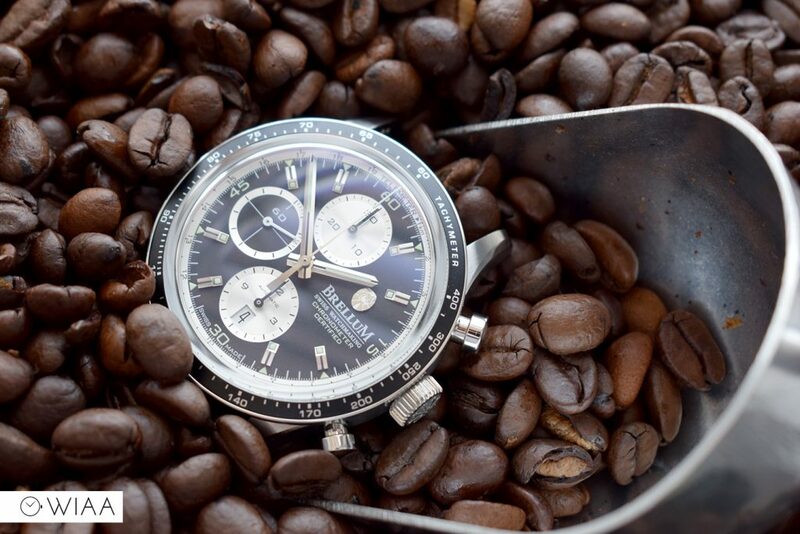 It has 25 jewels, runs at 28,800 bph (8 ticks per second), with a 46 hour power reserve. With a plentiful Côtes de Genève and blue screws. the movement is truly a beautiful masterpiece, especially at this price. Not only that, it’s also COSC certified. Using my Lepsi Watch Scope, it’s coming in at an impressive -1.5 sec/day. The custom rotor is also very striking in appearance – with gold painted engraving and a Wyvern in the centre. 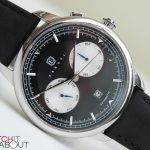 You get a fair amount of that classic “Valjoux wobble” – which is when the rotor is free spinning and ends up making the entire watch wiggle and move on your wrist. I personally don’t mind it, and it adds plenty of character to the movement. 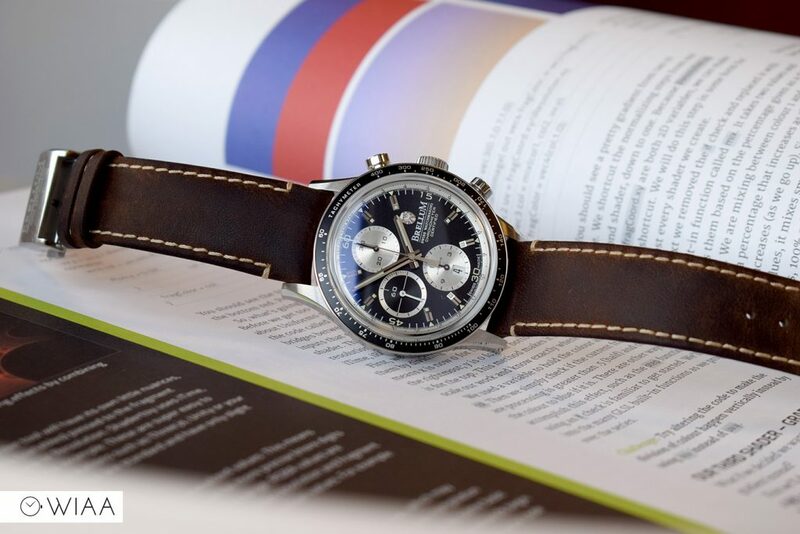 As I mentioned in my introductory notes, I only usually review watches over £1000 that truly offer excellent value for money. 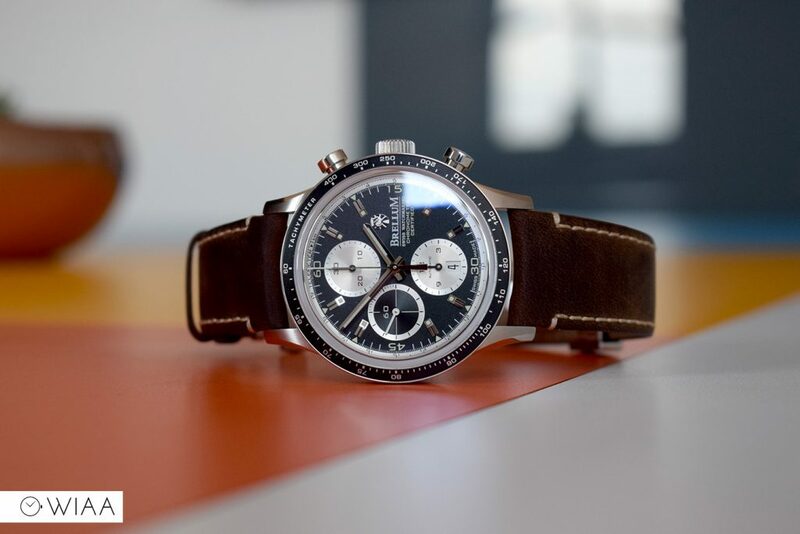 Say you’re after a chronometer / COSC certified automatic chronograph. 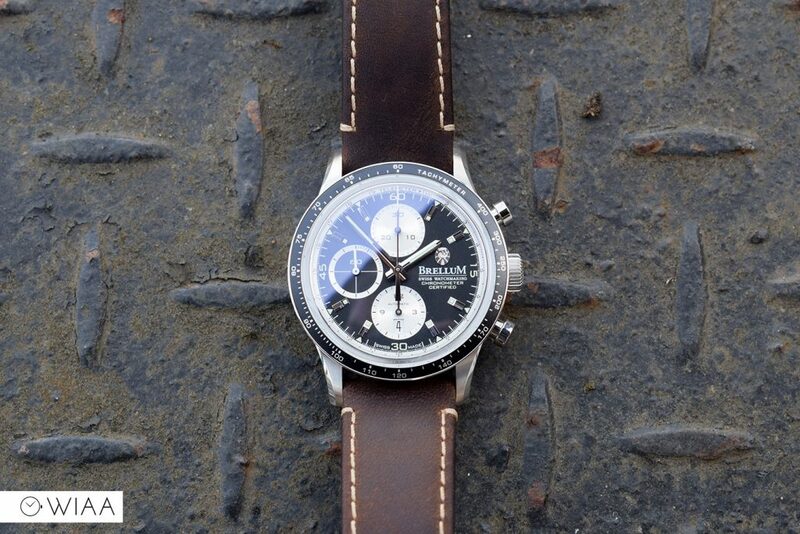 The majority of options will be almost double the price of the Brellum Pandial, especially from the bigger brands. However, what you’re getting here is a timepiece at a fraction of a price and near enough the same quality. The overall level of finishing is superb. 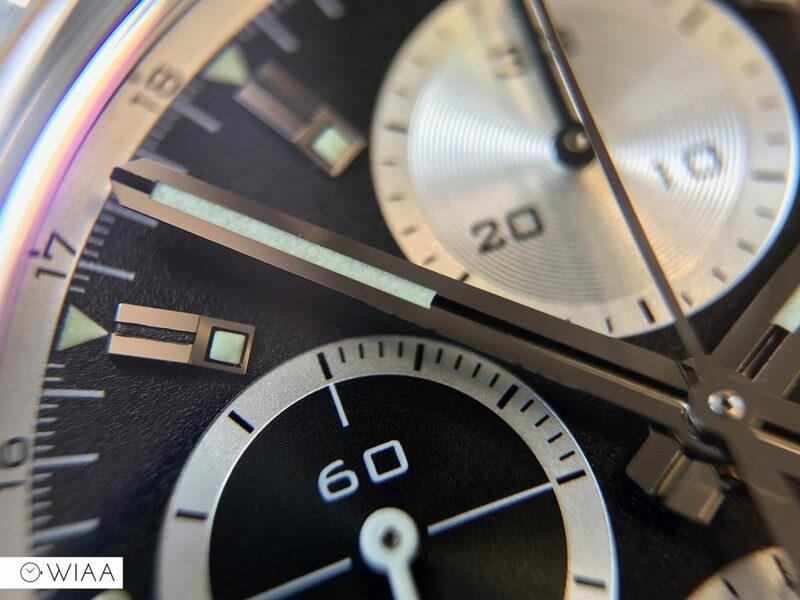 The movement is a joy to behold, and the detailing on the dial is literally as good as any of the bigger brands, such as Omega. The anti-reflective coating on the crystal probably needs to be even better to match the likes of Omega, but that’s all. The design is striking and terrific – it’s a real eye-catcher, and I’m yet to find someone who doesn’t like it. Of course, £1890 is a lot of money. 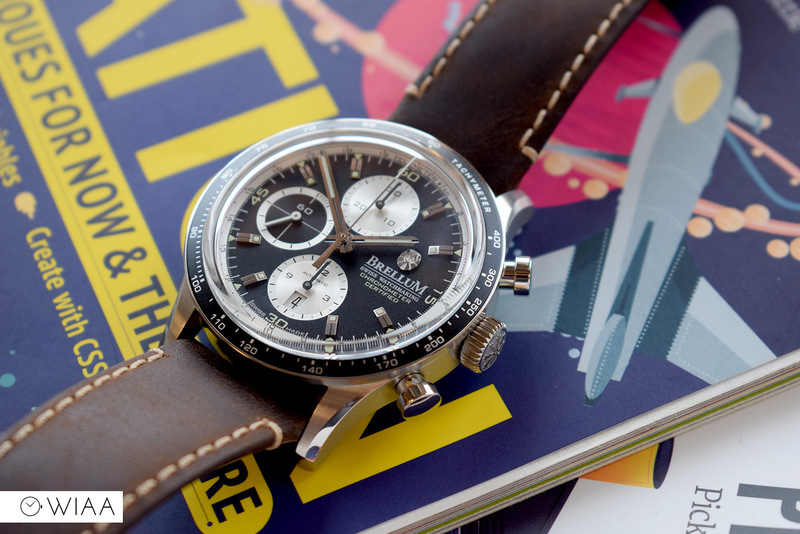 It’s not necessarily “affordable” as such, as it’s more than a lot of us can afford to blow on a watch. But, I can honestly say, it still offers tremendous value for money. 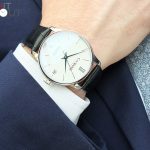 You are getting a watch that is impressively made, with just as impressive specs, for less than you’d expect. 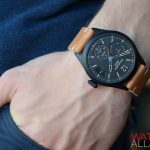 Great review and certainly, a great looking watch. 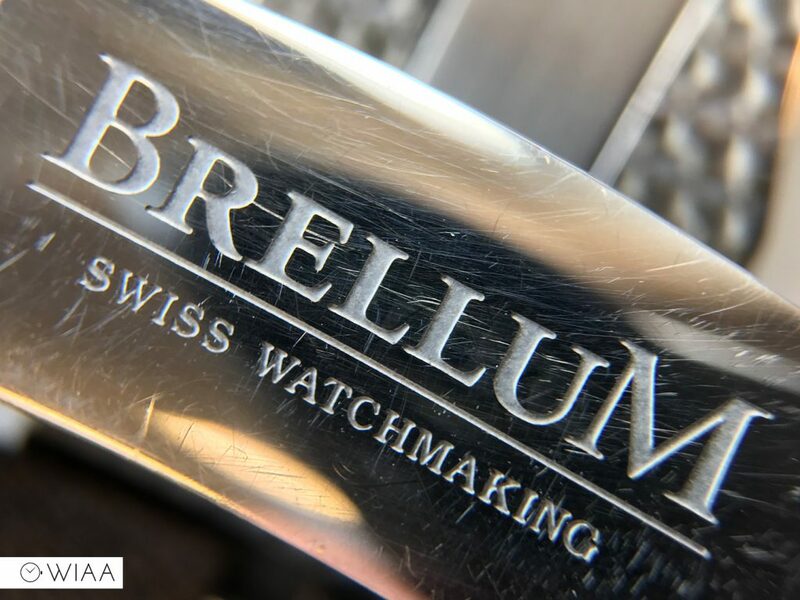 The Duobox feature may not be to everyone’s taste but there is no denying the bespoke Brellum purchase experience, dealing directly with THE watchmaker Sebastian over dial colour, case material and indeed case/build number. 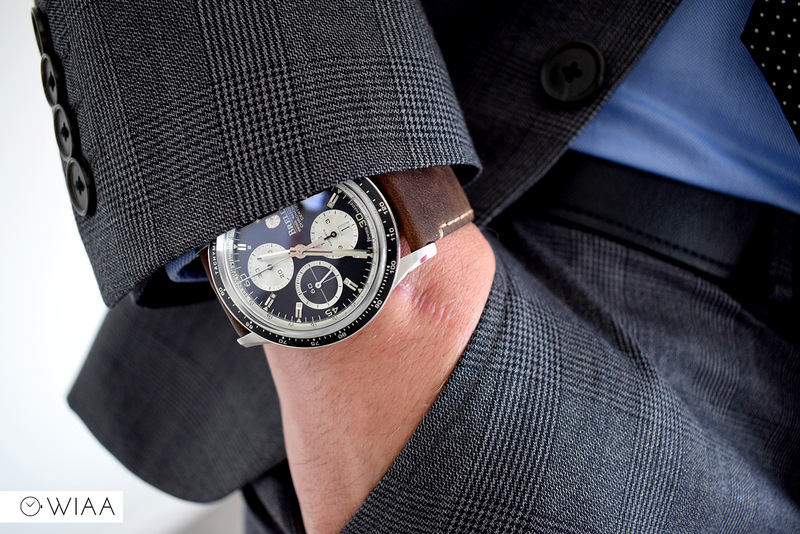 COSC rating and a genuine feeling of luxury cannot be denied; this watch is the cornerstone of any watch collection.